Sidewinder UK started work on the M6 16-19 smart Motorway contract for Carillion Kier JV on the 4th July 2016 placing and grading the final layer of subbase to the balanced central reservation in readyness for Tarmac Contracting to pave the Base and binder course expected to start Monday 18th July. An estimated 5000 tons of subbase in the initial 6.4km x 4.7m wide stretch of central reservation is scheduled to be completed on 20th July required the balanced central reservation to be paved in 2 halves projecting each carriageway crossfall aproximately 2.5% to a centre crown upon which Tarmac will pave aproximately 240mm of base and binder courses before the VCB (verticle concrete barrier) is installed. Sidewinder UK is in discussions to pave the wearing course infill to the North and Southbound carriageway for Tarmac Contracting on completion of the VCB installation. An average of 450te per day will have been placed and graded to a final tolerence in the region of +/- 10mm of the target level required which is well within the tolerence required. 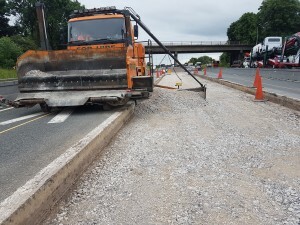 The 6.4km section of central reservation is the first phase of the second stage of the work scheduled to upgrade the M6 to Smart Motorway status from junction 14 to junction 20. 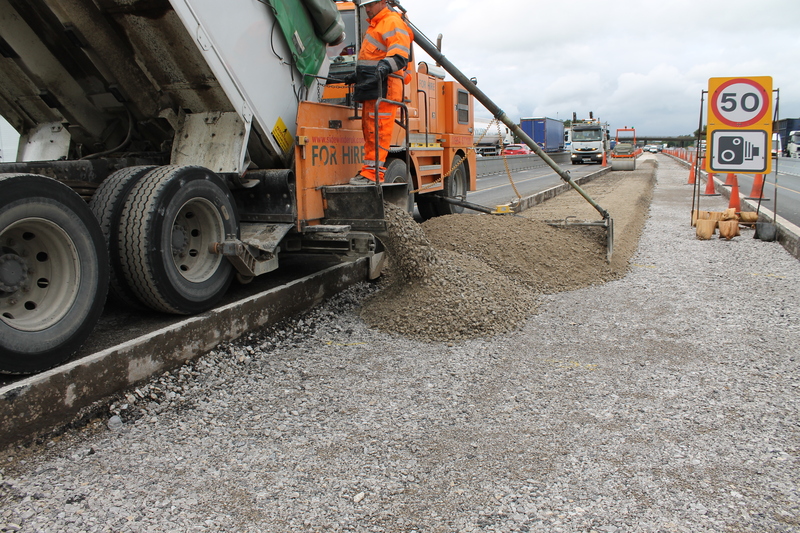 The previous phase of the work from junction 19 to junction 20 was managed by Balfour Beatty within which Sidewinder UK completed the Subbase to a similar design for GPL Group and paved the Permaflow concrete for Roocroft Road Restraint Systems. Sidewinder UK is the UK’s No1 offset paving contractor offering variety of services throughout the roading, airfield and racetrack sectors.